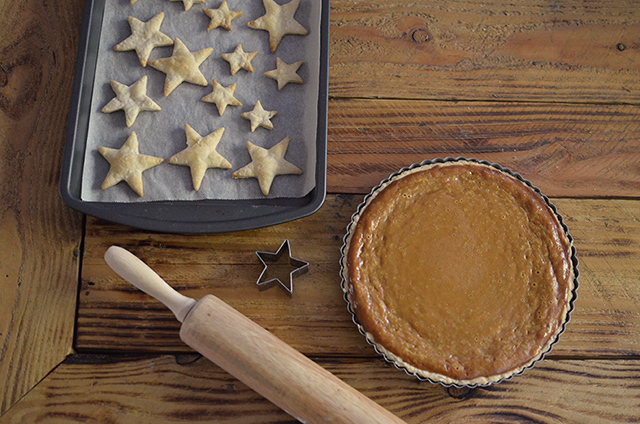 * I used this easy (but tasty) pumpkin pie and pie crust recipe. Ever since I saw this ‘apple pie in an actual apple’ somewhere on a web, it stuck in my head and wanted to try it. I mean it’s an apple pie with less flour and more apples! It’s pretty easy to make as well. 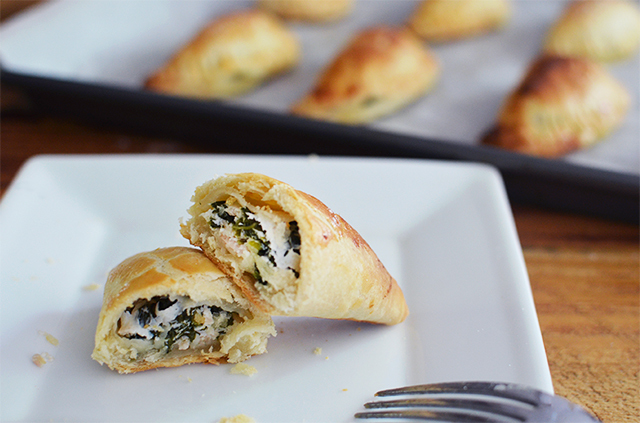 You can use whatever pie sheet you like (store bought pie crust works too). It tasted little less sweet than regular apple pie, so you can add more sugar if you like (or it’s perfect with ice cream!) *I lost the website address.. Let me know if you know who makes this. I read the recipe at the time, so remember a little but made it with my version. Ingredients: 5 granny smith apples, 1/4 cup sugar, 1/2 teaspoons cinnamon, 1 sheet of pie crust, walnuts and raisins as desire. 1. Preheat oven 375F. Slice top off of apples, then carefully remove the inner part of each apple with a large spoon. * slice thinly remaining one apple (for filling). 2. In a large bowl, mix sliced apple with sugar, cinnamon, walnuts, raisin. 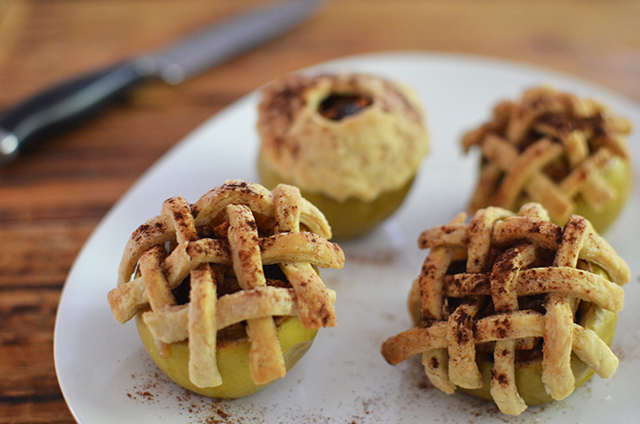 Fill hollow apples with apple filling. 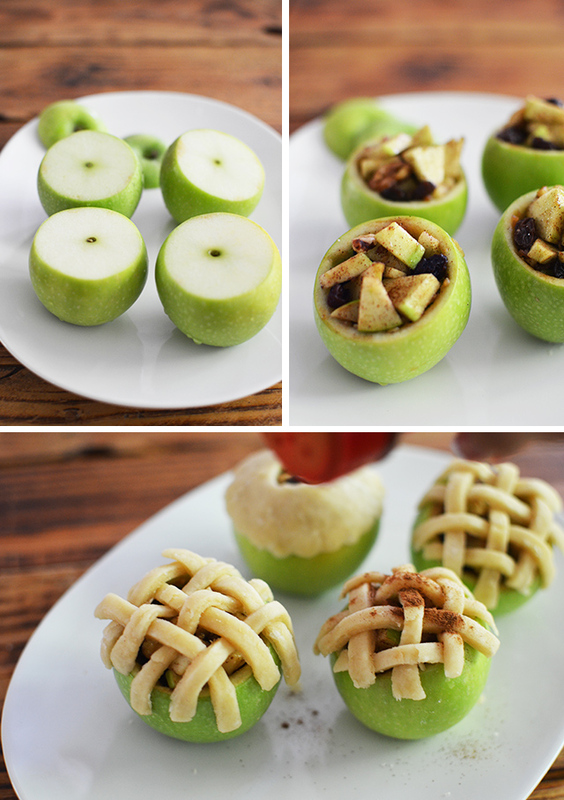 Slice pie crust into strips and cover each apple. 3. Add water to bottom of baking dish to cover the bottoms of the apples. Cover with foil and bake about 25 minutes. 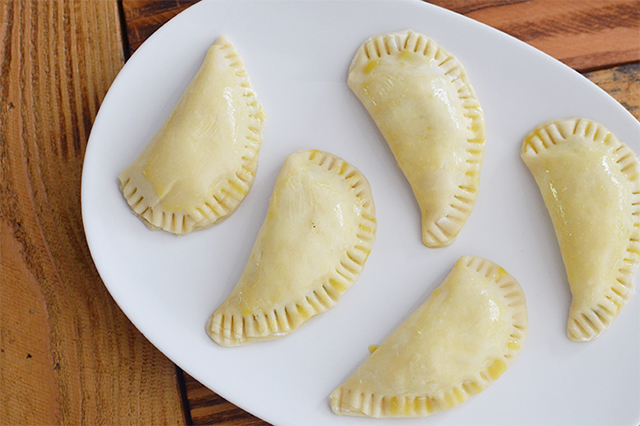 Remove foil and bake additional 20 minutes. Do you like pie? 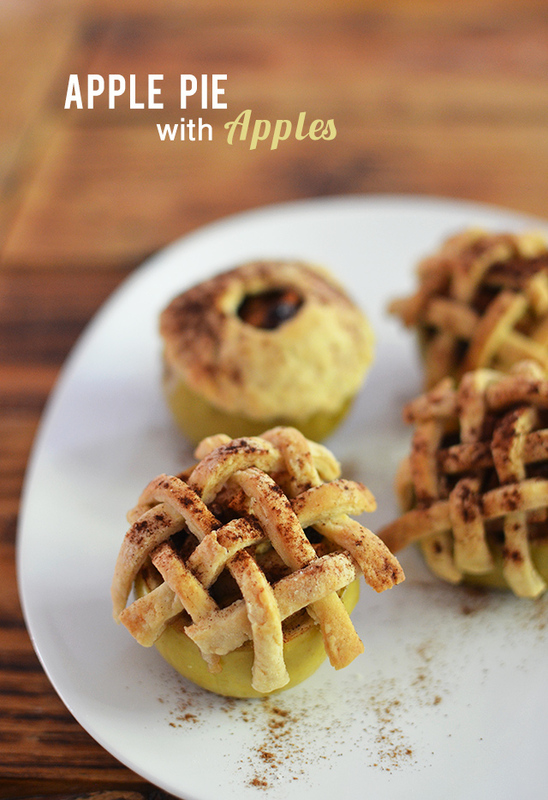 I love both dessert and savory pies – so yum I can’t resist it. I baked these when I went to my friend’s house to have lunch together a few weeks ago. She always cooks for me, so I wanted to bring something tasty and easy to carry too. Ricotta cheese is something I normally don’t have in my fridge, but I had a leftover as I made ricotta cheese pancake a few nights before (which slightly failed). These pies turned out so good and I’d love to make them again soon. 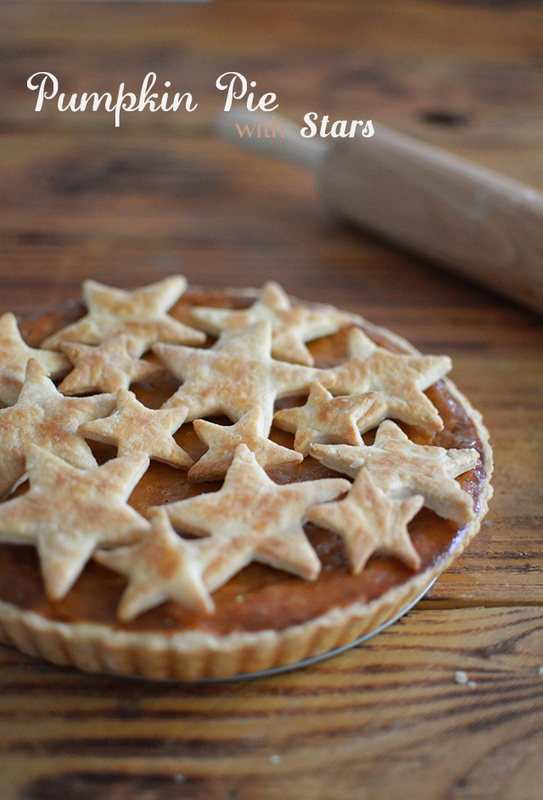 * This is a pie crust recipe I used. 1. Place spinach in a pot of boiling water, cook about 3 min, then drain. 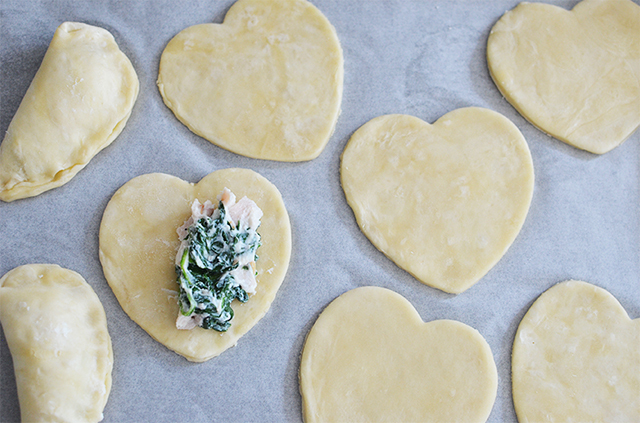 Cut spinach and ham into small pieces. 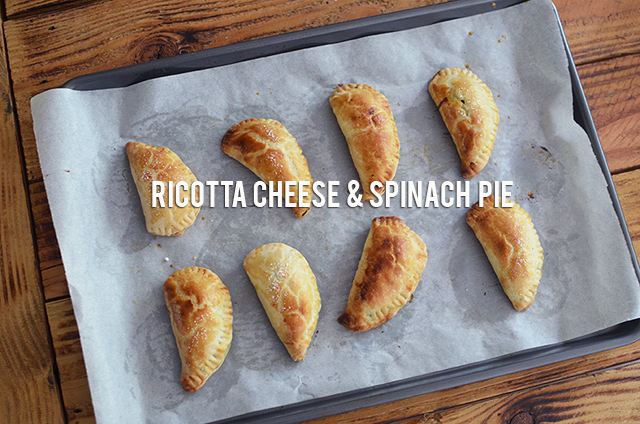 In a medium bowl, combine spinach, ham and ricotta cheese. Add salt and pepper to taste. 3. 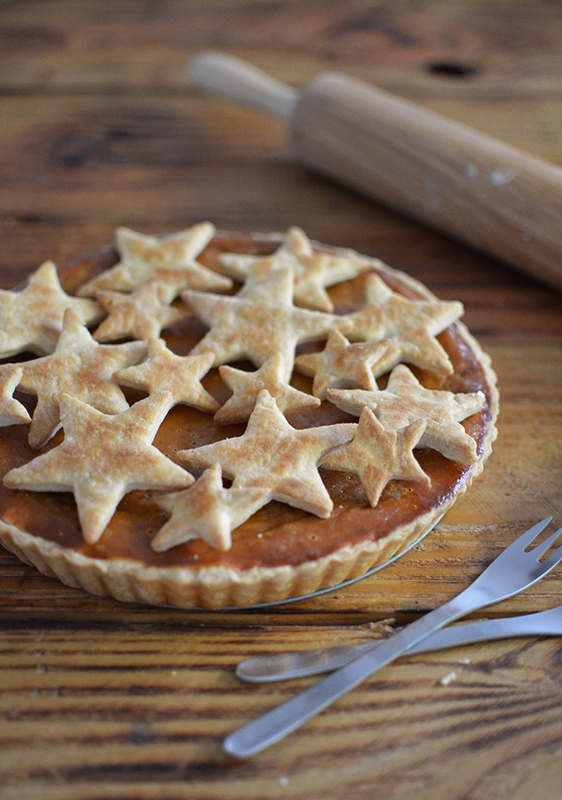 Using a teaspoon, add the mixture to the pie dough, fold the dough over into a half moon shape. 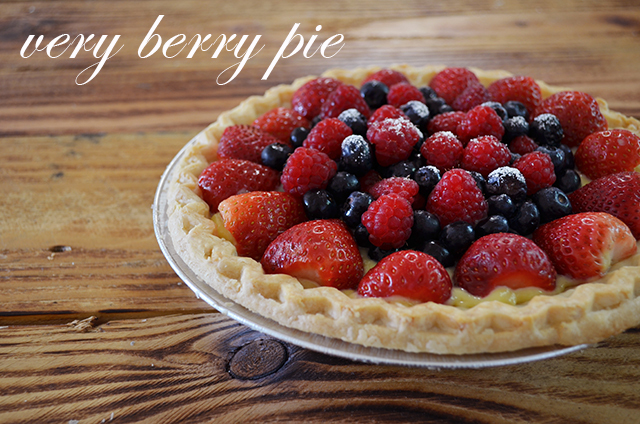 *Dip your finger into water and fun it along the edge of the pie. Brush the tops with egg wash.
I’ve been thinking about posting something like..’a city guide’ which I can introduce you to my favorite places. I love reading a blog that I can feel the atmosphere of wherever they live or travel. So I decided to start posting my favorite place to eat (or maybe to shop?) with my illustration. Hope you enjoy! 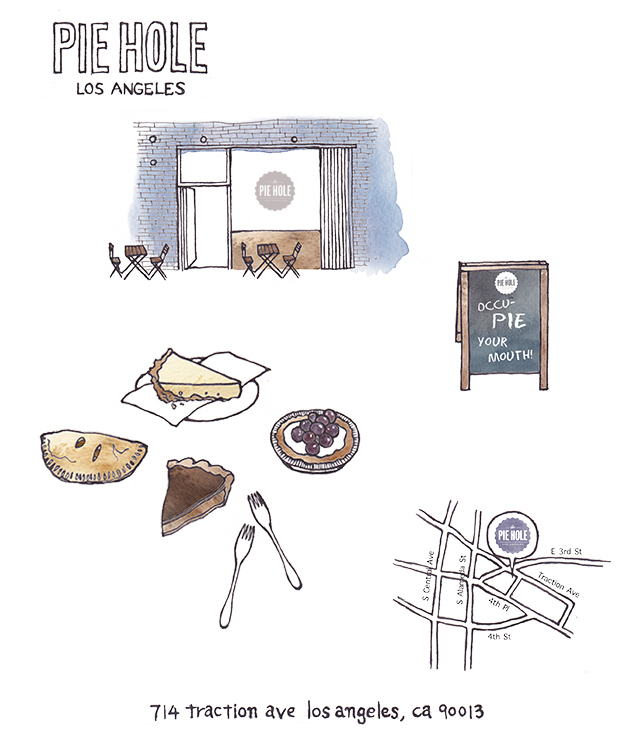 First place is The Pie Hole in downtown LA. I go arts district quite often, and love every pieces I’ve eaten either dessert or meal pies. This place is definitely a must go if you’re in the area! 色んな人のブログを読むけどその人の住んでる街や旅行先の様子が分かる記事が好きで日本の方のLA旅行の記事とか住んでる私が知らない所を紹介してたりで面白い☆ で私のブログは為になる様な記事もないなぁと何か始めたいと思ってたので、これから私のお気に入り店をイラストで紹介してみようと思います。始めはダウンタウンにあるThe Pie Hole。よくこのエリアに行くのでランチしたりデザートを食べたりしてるけどどれも美味しい☆ 店内もおしゃれでarts districtに行く事があったら是非! It was Omar’s birthday the other day and I decided to bake a pie. Although I didn’t know what to make even in a grocery store, I managed to get some ingredients thanks to my friend’s help. 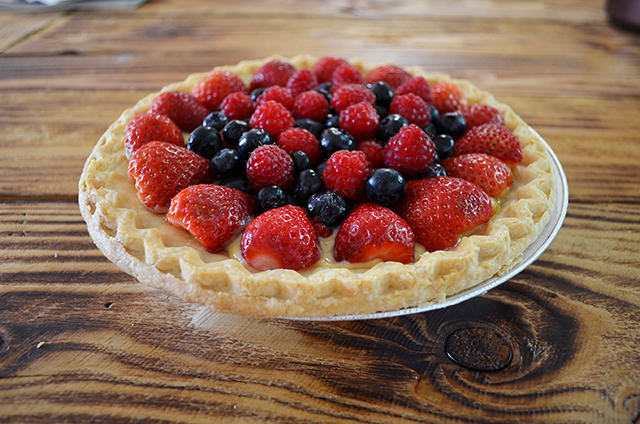 The berry pie was a perfect choice when I had a little time to bake since 1. easy to bake 2. easy to decorate 3. easy to carry. 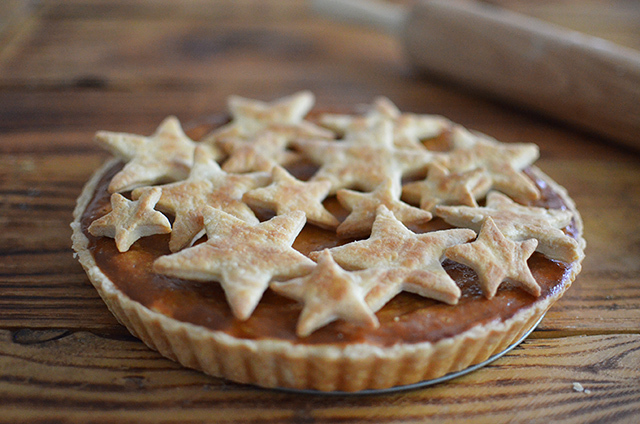 I used a frozen pie crust this time, but I’d love to make it from scratch next time. 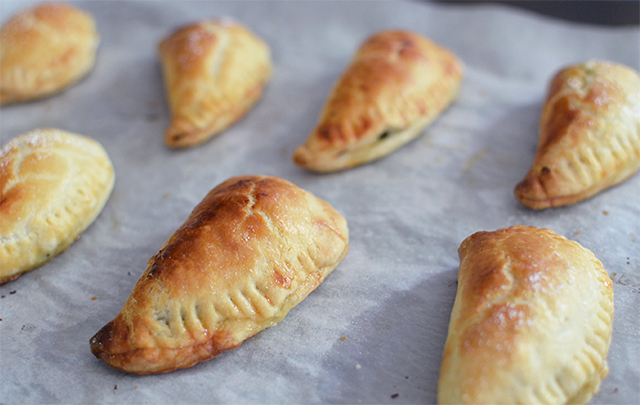 I’m happy that Omar and his family liked it :) *Custard filling recipe below. 2. 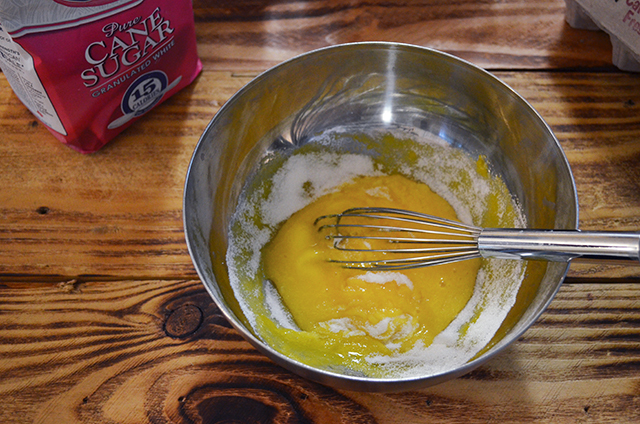 In a medium bowl, mix together egg yolks, sugar and flour. 3. 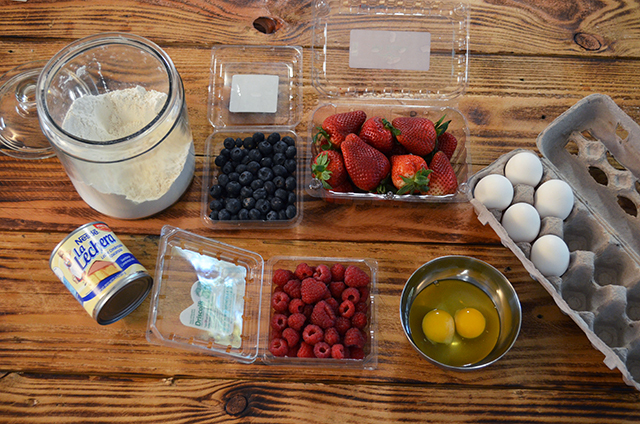 Drizzle milk into the bowl in a thin stream while mixing so that you do not cook the eggs. 4. 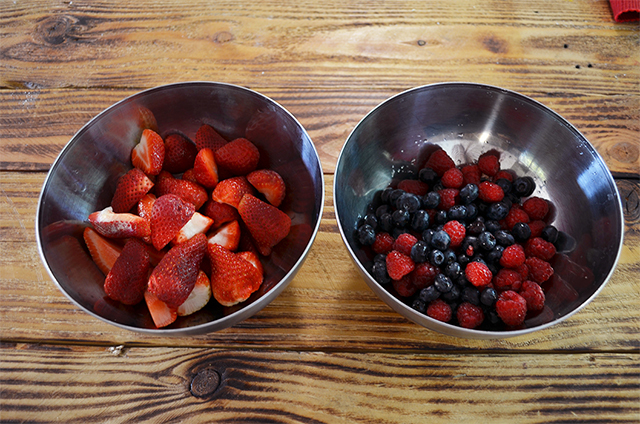 Return the mixture to the saucepan, and slowly bring to a boil. stir constantly. 5. When the mixture comes to thickens, remove from the heat. Add vanilla exact. 6. Refrigerate until chilled before using.